The Silk Road Central Asia Cultural Festival’ was held on November 7 with the aim to help students experience the culture of Central Asia. This event was hosted by the Center for Silk Road and Central Asia. It is an event for foreign students from Central Asia and Korean students to interact each other’s culture. 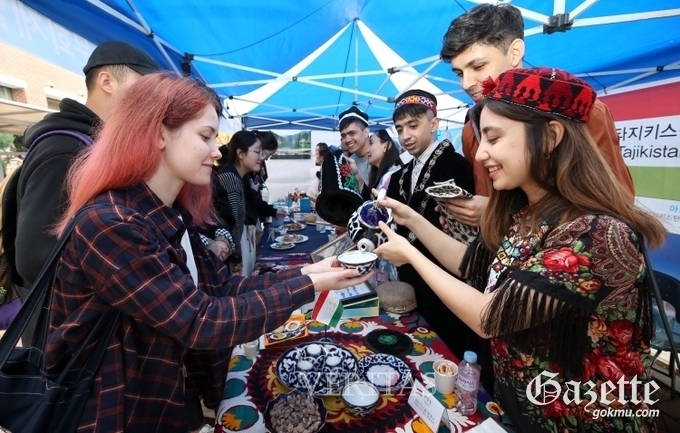 Students from various countries such as Uzbekistan, Turkey, Mongolia, Russia, and Kazakhstan personally operated the promotional booths, which provided traditional food, clothing, and music. Above all, many people visited booths to experience various traditional foods. In addition, there was a booth for foreign students to experience Korean culture through Korean food, wearing Hanbok and traditional games. It provided them a chance to experience it more comfortable circumstance than study. The center for Silk Road and Central Asia holds international academic conferences and cultural events every year. These efforts are taking the lead in introducing the culture of the Silk Road countries to Korean.